The clocks have gone back, the nights are drawing in -­ and digital SLR photography fans turn their thoughts to sunsets (especially if they've been inspired by the tips in our Photography Videos). You can get amazing images as the sun’s lowering in the sky as well as the moment it dips below the horizon. Your camera’s own exposure meter can usually cope well with this kind of shot and shouldn’t need any adjustment. Don’t despair if you miss the sun going down. You’ll take some of your best shots when the sun has just dipped below the horizon, illuminating only the higher clouds. Or if there are none,­ you get that amazing deep blue for about 10 minutes before the sky turns black. You’ll soon discover that clouds are the supreme ally of the dusk photographer, be they huge swathes of fluffy Cumulus or airy wisps of Cirrus. It’s amazing how many ‘tropical’ and ‘desert’ sunsets you can shoot on your own doorstep with a well placed fern or palm and some judicious cropping. Use the darkness to shroud any out-of-character objects that could spoil an otherwise atmospheric shot. Like all good digital SLR photography, all it takes is a spot of planning, imagination and some basic kit. But it’s not just equipment you need for great sunset photography. You need to know how to get the best from your camera because once you know how to use it - the camera becomes less important. One of these sunset photographs was taken with a professional DSLR and lens, the other using a compact point and press which cost £125. See if you can work out which is which. I’ll tell you at the end! Check out the sunset times so you can be ready ­- the sun always seems to set particularly fast in hilly or mountainous areas! Scout your locations well, anticipating where the sun will be at the critical time. Shooting as the sun goes behind a cloud before it hits the horizon is often very dramatic. Look for foreground detail you can add such as trees, people or buildings to set against the sunset. Take a good sturdy tripod ­- an absolute must. Avoid cheap tripods that are fragile or susceptible to vibration. The slightest, tiniest movement will leave you with a disappointingly un-sharp picture. Take a selection of lenses from short wide angles such as 10mm or 12mm all the way to the longest one you’ve got. Each different focal length will allow you to crop the shot ‘in camera’ as well as create different moods in the image. Use a low ISO of 200 or less and aperture priority set to a high ‘F’ number (16, 22 or more) for greater depth of field. This will force the camera to make long slow exposures -­ so that sturdy tripod really is vital! Experiment with filters -­ subtle pinks and purples can add a nice touch but you don’t need many filters. Let the sunset do all the work for you. Don’t forget -­ sunrises can be every bit as dramatic as sunsets! OK -­ hands up. Which image was taken with which camera? 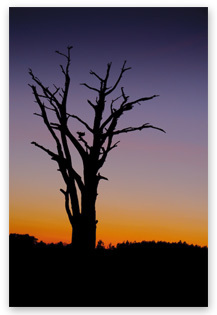 I shot the dead tree on a Nikon D300 with 200mm Nikkor lens. 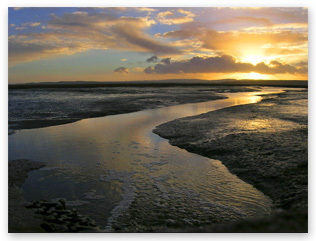 And the sun over the mudflats was using a five-year-old Nikon Coolpix. For more free digital SLR photography tips plus information on digital photography courses and one-to-one training days, contact us now.